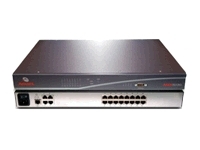 The Avocent AMX 5030 matrix switch is a 4x16 KVM appliance designed to help manage local servers and serial-based devices in SMB installations. It supports PS/2 and Sun server platforms and provides non-blocked access. A local port provides non-IP access to computers connected to existing Avocent KVM over IP switches.